The Caribbean Peering and Interconnection Forum, CarPIF, is set for St George’s, Grenada from 12 – 13 June, 2019. The Eastern Caribbean island of Grenada has been selected as the venue for the 5th regional meeting of the Caribbean Internet Peering and Interconnection Forum, CarPIF. The international event, which draws internet giants like Facebook and Google to the region, is focused on developing the internet in the Caribbean by improving policy and building relationships between network operators and content providers. Set for 12-13 June this year, this announcement was made by the Caribbean Network Operators Group (CaribNOG) and the Internet Society (ISOC), co-organisers of the unique annual event that it brings together policymakers, regulators, private sector leaders and academics. CarPIF plays a key role in bringing together different parties to form the relationships and agreements necessary to increase local traffic exchange across the region said CaribNOG Executive Director and co-founder of CarPIF, Bevil Wooding. “This event presents an opportunity for Grenada and the region to showcase the steps being taken to accelerate internet development in the Caribbean,” said Wooding. “In addition, the forum addresses the peculiar policy and regulatory challenges that have made internet connectivity, access and affordability difficult in some Caribbean countries. “Removing barriers to infrastructure development, content availability and internet traffic distribution can have a significant and positive on internet growth in the Caribbean, along with the benefits of economic development and social empowerment that follow,” said Wooding. CarPIF, launched in Barbados in 2015, was created to promote the development of Internet exchange points and greater regional and international interconnections between Internet service providers, content delivery networks and other content and network service providers. “We will be building on the momentum of past meeting where major international Internet companies like Google, Facebook and Akamai have participated alongside our regional and national internet service providers,” said Wooding, who also serves as the Caribbean Outreach Manager for the American Registry for Internet Numbers (ARIN). By staging CarPIF in Grenada this year, the organisers hope to highlight how the Organisation of Eastern Caribbean States (OECS) has been leading by example in the successful establishment of internet exchange points in countries like Grenada, Dominica, St Lucia, and St Vincent and the Grenadines. “Increasing Caribbean interconnections requires collaboration and partnership among a diverse set of stakeholders,” said Brent Mc Intosh, the local event coordinator and Head of Regional IP Operations at Cable and Wireless. “Hosting CarPIF 2019 provides Grenada and the OECS with the opportunity to showcase local initiatives aimed at improving the quality and efficiency of internet services in the region. “This is important because improved internet services facilitate greater socio-economic development,” said McIntosh. Manager, Regional Affairs for Latin America & The Caribbean Bureau of the Internet Society (ISOC), Shernon Osepa, expressed delight that Grenada was selected to host CarPIF in 2019, especially since the forum will be celebrating its fifth anniversary this year. 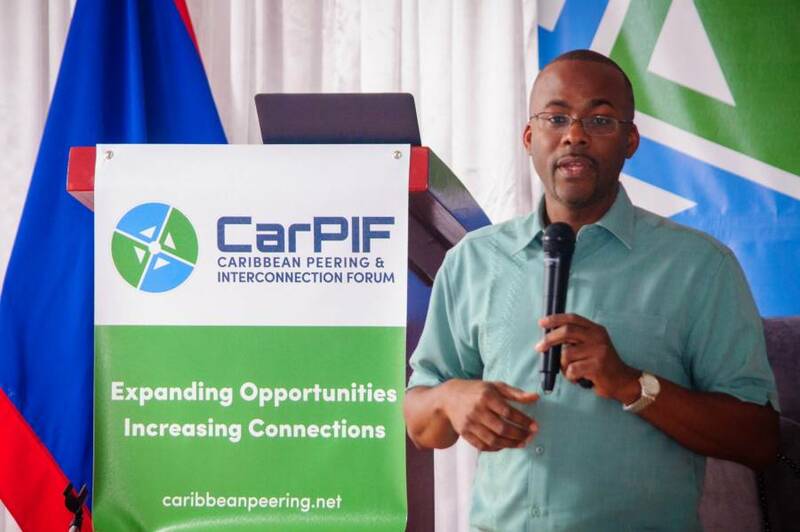 “From its inaugural meeting, CarPIF has sought to bring together key infrastructure, service, and content providers to improve network interconnection, lower the cost of connectivity, and increase the number of internet users and services in the Caribbean,” said Osepa, who together with Wooding co-founded CarPIF in 2015. “A very important fact unique to the Caribbean region is its vulnerability to natural disasters. Raising awareness on the need to build resilient telecoms and internet infrastructures is very important. IXPs can play a key role, till certain extent to keep local communications ongoing also during a natural disaster,” Osepa said. The CarPIF organisers affirmed that ISOC, CaribNOG, Packet Clearing House and ARIN intend to deepen the strategic partnerships cultivated with local and regional stakeholders like the Caribbean Telecommunications Union and the OECS Commission. “The relationship cultivated in CarPIF meetings and within the CarPIF community are crucial to the ongoing development of internet Infrastructure and services, and the acceleration of digital innovation and inclusion in the Caribbean,” shared Wooding. Over 100 participants from the Caribbean, North America and Europe attended the 2018 CarPIF in Belize City, Belize. The organisers hope to exceed this number in 2019.